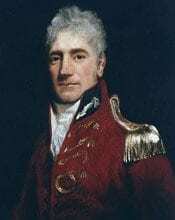 Lachlan Macquarie was the governor of the colony of New South Wales from 1810 to 1821. He’s claimed as the “Father of the Nation” for the coordination of the new colony for the many buildings, roads and bridges constructed and the beginning of the first proper town planning in New South Wales. Macquarie was born on the island of Ulva in the Inner Hebrides, Scotland, on 31st January 1761. His father was a carpenter by trade who around 1772 moved his wife and family to Mull, where he leased 75 acres from the Duke of Argyll. At 15, Maquarie volunteered for the British Army and in quickly got promoted to an ensign in the 2nd battalion of the 84th Regiment, known as the Royal Highland Emigrants, and served in Canada at Halifax and other parts of Nova Scotia. He was commissioned a lieutenant in the 71st Regiment in January 1781 and performed garrison duty in New York and Charleston at the closing stages of the American War of Independence. He returned to Scotland for the next few years and lived as a farmer with his family. Later at the age of 25 he returned to the army in the 77th Regiment, beginning a long period in India, where he saw much active service in the struggle to gain control of the subcontinent for Britain. In April 1809 Macquarie was appointed Governor of New South Wales, designated to take over from William Bligh due to the mutiny of the settlers and took up his commission as governor on the 1st January 1810. His term in office coincided with an increase in the number of convicts sent to the colony. His solution was to commence an ambitious programme of public works (new buildings, towns, roads) to help absorb these numbers. He encouraged well-behaved convicts into the wider community through tickets-of-leave. This policy of encouraging convicts and former convicts brought him into conflict with an influential, conservative, section of the local society. This group, known as the “exclusives”, sought to restrict civil rights and judicial privileges to itself. Many of these free settlers also had influential friends in English political circles. Frustration and recurring bouts of illness led him to submit his resignation on several occasions. He finished his term in 1821 and died later in 1824. There are many places in New South Wales named after Macquarie, including a river, streets and a lake. His picture has also appeared on stamps.